Discflo pump sets installed for a hard-to-pump application on an offshore oilfield. During a visit to a large consultant practice in Aberdeen during May 2011, ESI proposed a solution to an issue that an oil company were having with a “hard to pump” application on one of their North Sea offshore platforms. The application and its difficulties were again discussed during ESI and Discflo’s attendance at Offshore Europe, September 2011, also held in Aberdeen. Approximately eight weeks later, ESI supplied a standard Discflo pump, with a simple double seal and support system, for a three month trial period to replace an existing rotary lobe pump on their closed drains collection system. The rotary lobe pumps had experienced “several” breakdowns in their first year of operation. The Discflo Low Shear, Laminar flow pump was commissioned in late Feb 2012, and up to Feb 2014 the pump ran with zero reported downtime, despite being only initially supplied for the short trail period. Based on the success of the trial pump, it stayed in place as the process to purchase two customised units commenced in earnest. These were delivered in November 2014, and featured API 682 mechanical seals, with customised Plan 53B sealant systems. The Discflo pump itself is exempt from API 610 standards. The pumps and motors were combined on a customised load tested baseplate incorporating a drip lip to collect any spillages during maintenance. Both units went through an extensive documentation submission period and customer acceptance procedure to be prepared for their installation offshore. 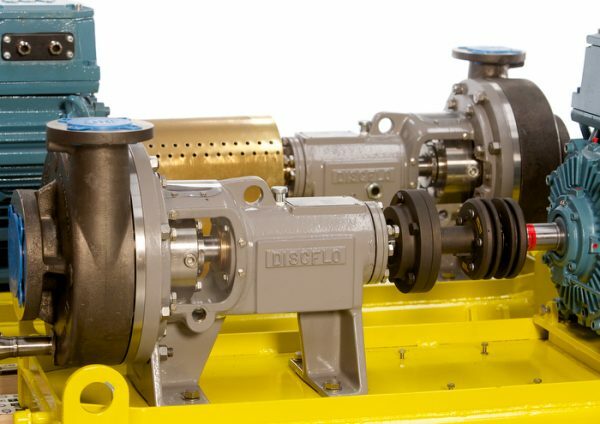 If you would like further information on Discflo, or other pumps, please send us an enquiry using the form or call us in Ireland +353 21 4510900 or UK +44 1633877505. We will be happy to discuss your requirements.